You found the gravestone, and you were thrilled to finally have the birth and death dates of your ancestor! You spend the money and (im)patiently wait for the death record to arrive. Finally the day comes when you open that envelope and…..
What went wrong?? You know it’s the same ancestor, so why are there different dates for the same person? The answer is a simple one. The informant. That’s right, the person who supplied the information. The truth is, people make mistakes. And frankly, sometimes people don’t know the information, and have to guess. Which date is the correct date? Well, that’s a bit trickier. You have to figure out which information is more reliable, based on the informant, and when the information was given. Death records have the informant listed on the record. If you know the informant was a spouse, child, or parent, then the information is pretty reliable. If the informant was the undertaker, then the birth date probably isn’t very reliable. Gravestones are not as reliable for the dates, because we don’t know who the informant was most of the time. It could’ve been anybody, really. And let me tell you, I’ve seen plenty of incorrect gravestones. On her gravestone, Nannie’s birth was stated as 1861. But on her death certificate, it says she was born in 1865. By looking at the informant at the bottom of the death certificate, I can see the informant was Grace W. Smith. I know that’s Nannie’s niece. Grace was born after Nannie, so it’s possible she didn’t know what year her aunt was born. 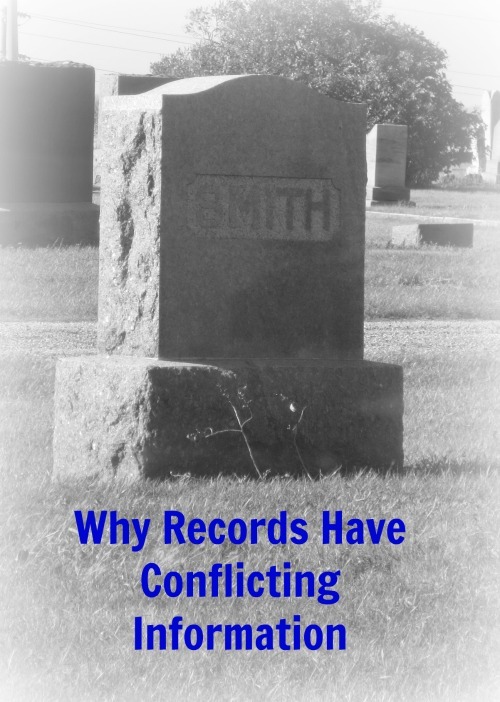 It’s important to compare other records and do more research. That’s right, there’s a little more work to be done. Grace can be found in the 1940 census, which marked who the informant was with a circle x (unlike any of the previous census records, which do not state the informant). Unfortunately, there are circle x’s for the Greenwood and Cooksey families, but not for Grace and Nannie. Who knows who gave that information? It could have been the neighbor. Her age estimates a birth year of about 1866. It may have been that Nannie already had her birthday that year, which would put her birth year as 1865. Now there are two documents supporting a birth year of 1865. It is interesting that Nannie was living with her niece Grace, who was her informant on her death record. Maybe she did know her birth year after all? More searching may find an obituary, sexton records, or family bible records. There is also the possibility that Nannie didn’t know what year she was born. Many people who grew up on farms did not celebrate birth days. But by comparing lots of records and identifying the informant, you can come up with the most likely date. For now, we are sticking with 1865, since 2 of the 3 sources match, and we know who the informant was on the death record, and that informant lived with the deceased. What about you? Do you have some discrepancies in your dates? Try identifying the informant, and comparing documents to see what information is more reliable.